Just to let you know, there are pre-opening tours on Sunday and Monday at the suggested donation of $10. Feel free to GIVE more because all the money will go to Second Harvest Food Bank and the YMCA, and dollar for dollar, Whole Foods will match the donation. Food Banks all around the USA are having a hard time right now because donations seem to be low before the holiday season. I personally support 2nd Harvest Food Bank (well, ya know I am all about the food and a food charitable org is right down my alley), so when an opportunity comes up that I get to taste food, be around food, and get to take a goodie bag with me from a food event, and it benefits a Great Food organization, I am all over it. How you can get involved with this food event for a great cause, click on the Whole Foods Market hot link above to sign up for the tour. As I was taking the tour, Darrah, the Regional Team Leader, was talking, also a couple of other section team leaders were talking, and they all were saying things that implies that Whole Foods wants to be a contributing entity to the Nashville greater community, not just a grocery store. It was a constant in the team leaders and employee chatting that they embrace one of the 5 core values Whole Foods has, "Care about the Community and Environment." My impression was that these leaders, from far and wide, really wanted to integrate themselves personally into the community, and make the store a good steward of greater Nashville. I feel like Whole Foods will participate in charitable endeavors to benefit the greater Nashville area. Whole Foods maybe like any other market and out for profit, but Whole Foods does have a core value to give back to the community, and I believe they have already, and they will in the future. I was also taken aback, in a good way, when I made comments of my person agenda for food shopping. Darrah and Jolie, a Nashville Team leader, were both open to listening to my comments (my wants really), they were considering my comments, and they said that my wants are already addressed (ex. salad bar will be there until closing, so when I am done at the gym at 9 pm, I got dinner), or they are in negotiations with sources. Most people around here know I strive to cook with about 75% local ingredients. When I was down in College Grove a few weeks ago, home of Hatcher Dairy, I had already heard from the Hatcher Dairy folks that Whole Foods is sourcing local milk from the Hatchers. I jumped for joy because I love fresh local non-homogenized whole milk, and I don't have to drive 20 miles one way anymore! So, with this, I asked Darrah what Whole Foods was going to do to source locally. She assured me that they are in negotiations with at least one local cheese maker, and some veggie growers, but because the dotted line is not signed yet, she could not tell me those sources. For other local sources I may want, she told me I could always talk to Sheryl Williams, the Specialty Foods Team Leader. Judging from this tour and receptiveness of the staff so far, I really believe that the leaders will listen to my comments and questions, and they will be considered. On the tour, as we rounded the corner to the bakery department, there were sheet pans of cookies, biscuits, breads, croissants, and pastries. Apparently Trish, the resident baker, has been testing the bakery kitchen and making baked goods to be taste tested by all who are working on getting the store open. Well, the treats were out there for us to taste too. I picked up a croissant, not expecting much. I bit into it, it was cold because it has been sitting out on the rack for a while. 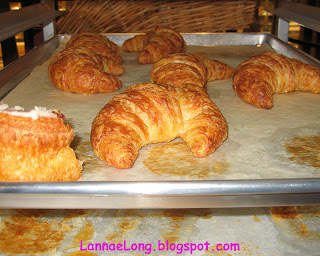 BUT, it was buttery, flaky, light but also sturdy enough to give the teeth something to bite into. The croissant was bite-able and not rubbery or chewy. An involuntary sentence came out of my mouth, and it was, "I can't believe this, this is better than XXXX (another bakery)!" The croissant may not be like my friend Sophie's boulangerie croissant in Paris, but this tasty treat is one step closer to that. Whole Foods will have all the standard foods to cook with, but from a wider sourcing base than Nashville has ever seen. There are at least twice as many oil sources than at any other store in town. There will be, at least to start, a wide range of fruits and veggies that will be a wider range than any other store in Nashville. I saw a wall of baskets that will have at least 150 different specialty fruits and veggies outside of the typical carrot, lettuce and apples. I asked Darrah if Nashville is ready for that, and will people buy the "exotic" produce. She looked at me, and said "YES!" Darrah is from a really large mulit-cultural city with at least 800% more people than Nashville's population, so I am not sure if I whole heartedly agree because of our quite smaller population. I personally would love to see the variety succeed, and I will keep my fingers crossed. 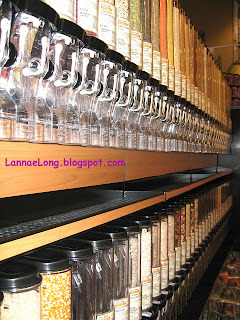 I would love to be able to buy more Asian and African ingredients, but only time will tell. Whole Foods has multiple areas of the store that will be selling a lot of freshly prepared foods, like the salad bar, soup bar, pizza bar, other bars (I can't remember them all) and this bar The Grill. 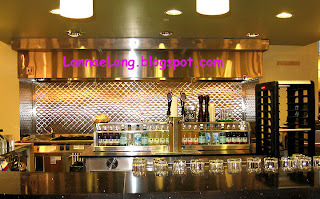 It is supposed to be a place where people can stop in for lunch or dinner, and get a quick fresh bite, or have it cooked and packed up to take home for a meal. The USA has embraced convenience foods, such as frozen meals, take-out, fresh pasta, etc and Whole Foods has capitalized on this way of eating. I am guessing that people want to eat good food, eat at home, but don't have the time to cook. I mean, double income, kids in activities and sports, who has time? This store is gonna help solve the problem by enabling people to do some grocery shopping while their grilled chicken and veggies dinner for the family is being cooked at The Grill. It is not like those chickens that have been sitting on the heating pad all day long, like at other stores, it is going to be fresh made and ready for families to eat, giving the illusion of a home cooked meal. We talked about that fresh take-out concept last night. We don't like looking in sad glass food cases, with dried out slabs of stuff, with unknown time origin, and we don't buy that stuff. If we could see the ingredients, see it being made, we would love to save time and buy fresh dinners for ourselves. It is a great concept, and I have not seen this done at most any store in the USA. It is like the "fast casual" restaurant concept meets the grocery shopping world, and it is a marriage made in convenience and fresh heaven. The last stop was the "salud" cooking class room. Salud means healthy restaurant. Whole Foods will be offering cooking classes, there will be a fee, and limited number of seats per class. So far, they don't know who they will partner with from Nashville. There was talk about having local chefs, cooks and restaurant chefs come and teach, but nothing has been set in stone yet. Maybe there could be an "eat locally" class next spring. I just cooked a great menu with soup, salad, smoked veggies, lamb and I forgot the potatoes, made of 100% local ingredients. It can be done, it can be tasty and it can feel great to eat locally. I have high hopes for our Whole Foods. So far, every want of my personal food agenda seems to have been considered, discussed and Whole Foods has something in the works. There are even things that I did not know I wanted, they presented, and I thought that it really is what I wanted. There are concepts being built into this store that are focused on the customer wants and needs. The staff seems empowered to serve the customer the way the customer wants to be served. I am hopeful. Open already, let's get the show on the road! Earlier this week, I was one of a few lucky people to be invited to a complimentary tasting menu of Capitol Grille's Chef Tyler Brown's new fall menu paying tribute to Nashville's tradition of the Meat and Three. I am just going to put it out there, this was the FINEST Dining Experience I have ever had. It was an all senses, 5 hour, Experience that I cannot stop thinking about. This Dining Experience defines Wonderful! I want to thank Chef Brown, Janet Kurtz, the Capitol Grille staff, and the Hermitage Hotel staff for being such talented and kind hosts to my guest and myself. The Capitol Grille staff wanted to get the invited guests' opinions of the new menu, and my opinion is that Chef Brown has hit his stride and has brought his dishes to a level surpassing all others in the fine city of Nashville. I have been here to dine before, and I will say the dining experience begins at the front door with the valet parking. The valet service has always been polite, efficient and trustworthy even to me with my dented 7 year old aluminum siding bucket, called my car. The service is higher quality than anywhere else in the city, and I would akin the service to the Four Seasons in NYC. I really felt like $1.2 million the minute they opened my car door for me. 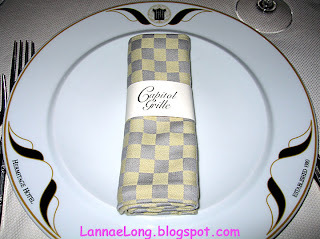 I need to clarify, the Capitol Grille restaurant of the Hermitage Hotel is NOT part of the mid-line chain Capital Grill. The Capitol Grille is its own, chef inspired and quality driven restaurant. We had Kimberly, a Hermitage Hotel staff member at our table, and she was mentioning that the restaurant has been renovated with new carpet and linens. I must note, the linens were an exceptional weave and thickness, and are of better quality than what I have at home. 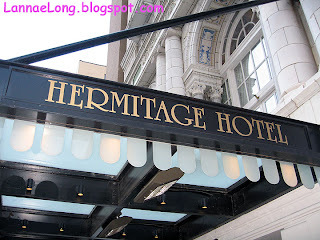 Kimberly also pointed out the history behind the hotel and the restaurant, which I have previously blogged about, and can be found on the Hermitage Hotel website, and there is just too much to repeat here. If you have time to read about the history, it is very interesting what role the Hermitage Hotel and the Capitol Grille space played in August 18, 1920 and having the final vote to give women the right to vote. To start as an amuse-bouche, the chef made a Concord Grape jelly topped with a scroll of mallard duck breast confit, and pistachio dust. 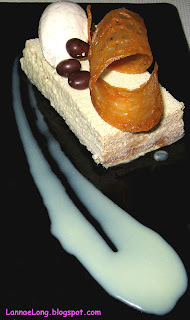 This amuse-bouche really got our attention, as it was a nice start of the food event to come. I actually heard people around the table say, "Oh Wow, that was nice!" 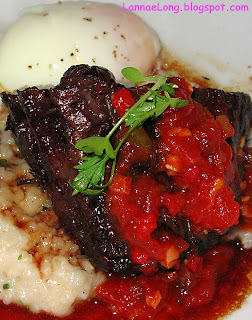 The 1st course I opted for was the Kobe beef short rib with a smoked tomato relish with a poached pullet egg over a cracked golden rice risotto, and this was a play on a diner's meat and three's steak and eggs. The pullet egg is an egg that has been laid within the 1st 20 weeks of a hen's egg laying life, and are considered the best eggs. I love braised Kobe beef short ribs, and I loved this dish. It was delightful to take a bit of short rib and dip it into the poached egg yoke and enjoy the richness. The wait staff was unbelievable this evening. They could answer all my questions about the food, such as sourcing name and location, slaughter technique, and preparation method. They also were on point with wine pairings. Ya know, I am just a simple gal blogging about food, and it was such a treat to have some Silver Oak Cab paired with beef, that now I understand that magical wine pairing concept. Rarely, in my world, do I get to have the perfect wine with each course, so this evening was a real treat. My dining companion, with whom I shared food with, started with the pork belly and apple Napoleon. I got to taste the pork belly and it was perfectly seasoned, tender with nice crispy crust. I only got to have one small bite of the pork belly, and I was in heaven. Chef Brown came out to talk to us, and he said that the new oven and stove has some crazy level of BTUs, something like 90,000 BTUs. The excessive BTUs, I am assuming, is what allows the outer crust of the pork belly to be crispy without over cooking the rest of the pork. 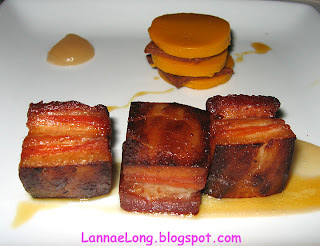 The presentation was really fun with three perfect pork belly cubes and a lovely apple Napoleon. The Chef created mini-starter plates to let everyone try a different starter plate from what they had ordered. We got a mini-beet salad with drops of ice wine vinegar and a goat cheese fromage blanc. The vinegar was sweet and sour which went well with th beets. 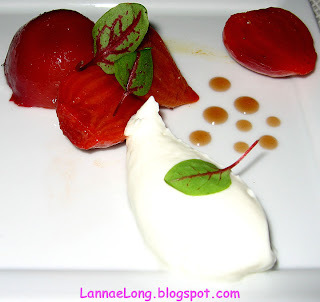 The smooth and slightly sour fromage blanc went well with the crunch beets. It was a nice fresh intermediate tasting before my next dish, the soup. The soup, the soup, the soup. I love this soup. I am thrilled that Chef Tyler Brown decided to keep this classic on the menu, and this night's soup was as good as days and years gone by. They may be a few fat grams in this soup from cream and butter, but as long as I eat it only every once in a while, I think it is ok. The presentation is just fabulous. In the big bowl, there is crumbled bacon and a brie grilled cheese crouton. 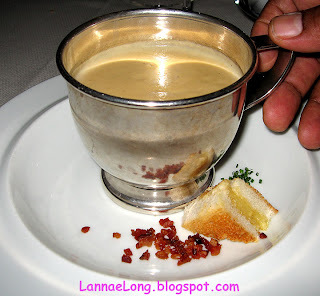 The server picks up the big silver cup full of the onion bisque, and then swirls the soup over the bacon and crouton. I felt really pampered by having the server conduct the final preparation of my soup. The soup is rich, creamy, with a light sweet onion flavor. At this point, I have already had more than enough food for the day, let alone dinner, and I still had my entree to come. 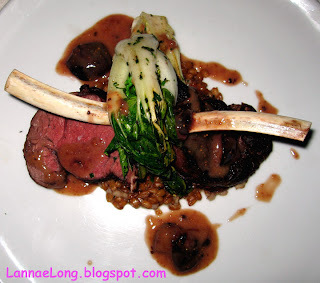 I opted for farmed elk chops with farro, bok choy and fig sauce. The farro ws prepared simply and straight forward and presented as a fairly plain grain. The farro reminds me of a large barley grain with a a sturdy texture. The fig sauce was a simple figs stewed to a chunky lightly sweet compote. It tasted like the Chef used sugar sparingly to create the fig compote because it was so delicate, lightly sweet and a perfect accompaniment to the elk. The elk really wasn't gamey, but it was a dense and rich cut of meat. The simple farro, the light bok choy, and the light fig sauce were the perfect balance to elk. I could not tell if the figs were fresh or dried. Since I have had fresh figs only twice, and never cooked with them, I don't have enough experience to tell if they figs here were fresh. My guess is they were fresh when the Chef created the sauce. I was only able to eat a few bites of this entree because I was so full, so I asked Jeff to pack up my entree so I could enjoy it another day. My dining companion got an item from the grill and opted for a rare 21 day aged striploin. The presentation was straight forward with the grill and 90,000 BTUs creating a near Pittsburgh style steak. I love Pittsburgh style, charred on the outside, and extra rare on the inside. This can only be achieved by having a lot of BTUs, and most home ovens and grills don't have enough BTUs. 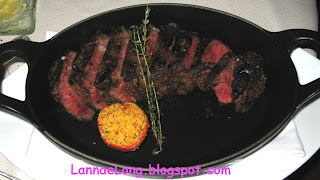 The aging of the steak is really important to concentrate the flavor of the meat. I do this with nearly all my roasts or steaks in a shorter way. When I can plan a beef meal, I like to have to beef opened on a rack in my fridge for at least two days before cooking it. It is really fun to be able to share that trick with guest who demand the recipe for my roast or steak. When I tell them it is all about the aging of the beef for a few days before cooking, then salt and pepper or soy sauce, toasted sesame oil, garlic and honey then grill or roast the beef, they are floored. They really think it is a special ingredient, but no, it is just time and air as the magic ingredients. Anyway, this 21 day aged beef has a really nice concentrated beef flavor. My dining companion was stuffed too, and took half home for a treat later. So, I asked for a side of mac and cheese because this is the best mac and cheese I have ever had. 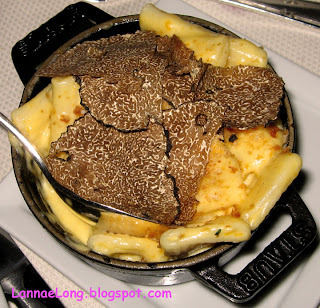 The truffle oil in the mac and cheese makes the side dish umami, irresistible. For tonight, the Chef pulled out all stops and shaved Bordeaux truffles on top. Believe me, this was a treat that made me pinch myself to make sure that I was really sitting in the Capitol Grille eating such a decadent fungus. I took one piece of shaved truffle and held it in my mouth to try and remember the moment. A few weeks ago I went to a specialty store and stood there for about 15 minutes, and looked at buying one little truffle in a tiny little jar worth more than my weekly budget for food. I just could not justify the purchase that day, but I have been thinking about that truffle, and can see the shelf in my mind. So, I sat in my chair at the Capitol Grille, and really enjoyed the moment with an entire slice of truffle on my tongue, thinking about truffles, inhaling the nose of the truffle, and feeling the texture of the truffle when I finally nibbled a bit off the slice of truffle. I think one of the people sitting near me was saying something, but because I was so focused on trying to remember the moment, I have no idea what he was saying. So, there was some leftover truffled mac and cheese in my side dish, so I put every last bit on my plate before Jeff came to take my plate and pack it up. The next day I heated my leftovers for our dinner, and I got to savor every last bite of the truffled mac and cheese. 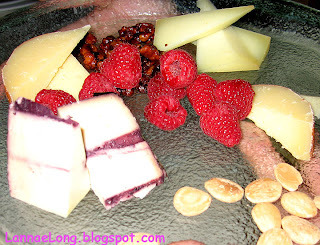 The Chef offered a cheese dessert plate. We were stuffed, but we ordered it anyway (I know, gluttony is the word). 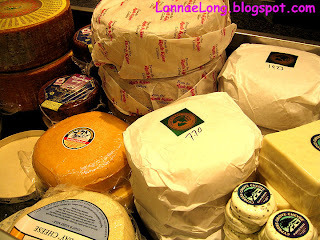 There were goat, sheep and cow's milk cheese. We decided on three of the cow's milk. The one cheese soaked in port wine was nutty, had a parm texture with bits of calcium peppered inot the cheese, and had a slight port nose. It was fantastic. The cheeses are not the normal ones you can get in town, and I have never seen these cheese sold anywhere in Nashville. Oh, as a cheese lover, I may have to come back and get a take out cheese plate for a mid-night snack. Dessert, a fine way to end the meal. Our hostess Kimberly suggested that we get one of every dessert and pass them around, and that is what we did. The memorable ones in my mind was a chocolate torte with basil ice cream, crustless cheesecake, and the apple creme brulee. I am not sure how the pastry chef got the essence of apple into the creme brulee, but it was almost too powerful in apple flavor. The cheesecake was really dense and smooth, and what I always hope a cheesecake would be. In conclusion, I think Chef Tyler Brown has come into his own. His approach to food is in the current era, fresh, excellent sourcing, balancing flavors and textures, and letting the natural flavors come through. 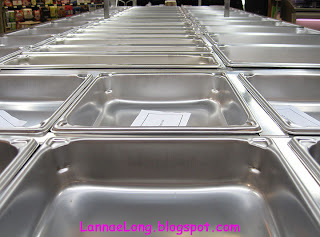 The focus seems to be on great preparation techniques for fewer components to a dish, and making each component count. I like this. When there are too many components, the focus of the dish could be lost, and the dish may be confusing. During this special dining event, believe me, there was no confusion in any of the dishes I tried. The ingredients, the preparation, the wine, the service, the decor, the table linens, the bathroom, the valet, the floor, the wood walls, everything was spot on, and basically made me feel like a queen. Folks, I felt like a queen! No kidding. It was tough to go back to my normal life and realize that I am just shy of being royalty. I am sure though, when I do dine at the Capitol Grille again, I will be transformed into a queen again. And what would that homeland be? That would be Poland! The Homeland Cafe is owned by the Kosny's, who immigrated to the USA many years ago and missed the food of their homeland. They took over an "E" floor plan house (during the WWII Manhattan Project located in Oak Ridge, TN, all houses in Oak Ridge were built by a government contract with a limited number of building plans labeled A, B, C, D, or E) near the Oak Ridge hospital, and converted it to a restaurant. 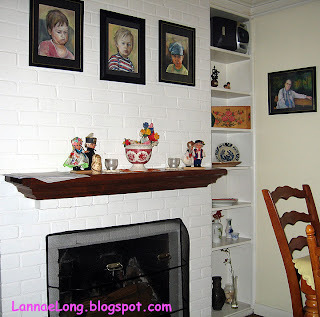 The dining room, living room and bedrooms are all now dining rooms. One of the best parts of this restaurant, besides the food, is the decor. It is like stepping right into the parlor of an Eastern European grandma. Everytime I am in Oak Ridge, I have to go to the Homeland Cafe for homemade pieroghis, golabkis, saurkraut and potatoes. On my last trip through Oak Ridge, I stopped in to the Homeland Cafe for lunch, and got a golabki and pieroghi plate. The pieroghi dough is made in-house, has the perfect bite-feel and is delicious. 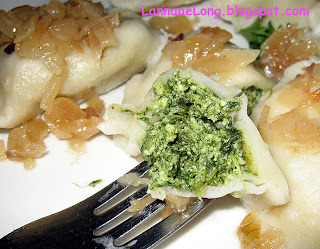 The pieroghi stuffings include potato, cheese, and spinach. 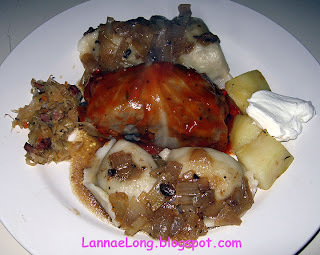 The pieroghi toppings include butter, mushrooms and onions. It is so nice having this homemade food while sitting in a living room. It is so homey and relaxing. Actually, last time I was there, there was a grandma aged Polish woman waiting tables, and it was nearly like being catered to by Grandma! I just had a hard time moving myself out of this restaurant and on my way to my next destination because I just made myself at home at "Grandma's House". So, on the way back, I had to go through Oak Ridge again, and this time I stopped for dinner at the Homeland Cafe and got the pieroghi plate. I opted for spinach pieroghis with the onion sauce. The pieroghis are perfectly boiled and have a good mouth feel. As a matter of fact, I loved these little pieroghis so much, I got two to-go plates of pieroghis to take with me back to Nashville. Mrs Kosny was so sweet, and she said that I couldn't take the pieroghis home without a sauce to put on top. She found two little air tight jars, so they would not spill in the car, and filled one with her mushroom sauce, and the other one with her onion sauce. She gave me some directions on how to re-heat these little gems. I boiled the pieroghis in a wide pan with water. It did not take much to bring these yummies back to their glorious selves. I await the day that I must return to the Oak Ridge area, and revisit the Homeland Cafe. ...good for your heart, the more you eat, the more you fart. Do you remember that saying as a kid? I do. So I headed down to the Franklin Farmer's Market Saturday, and got lots of veggies like squash, potatoes, garlic, herbs, arugula, red snapper (which is from the fish market and not a veggie) and some lima beans. Check 'em out. They look like pea pods, but they are lima beans. OK, so how many of you city slickers thought that lima beans were just these light green oblong shaped things that are starchy in nature, and many of them come in a baggie in the frozen food section? City slickers are you raising your hands? Before today, I logically knew limas grow in pods, I had even quickly seen the bean lady at the Nashville Farmer's Market dump a bunch of pods in her automatic de-poder. BUT, for some reason, I still had it in my mind that lima beans magically appeared like they are, and are ready to cook. 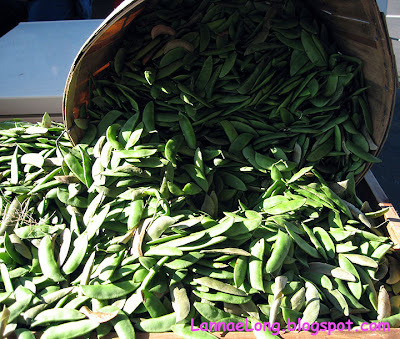 Today, I finally got to handle and buy limas in the pod. You know what I am gonna do? I am gonna put the bag of these in front of Matt, while he watches the football game, and show him how to de-shell a bean. Oughta be fun for him! I saw in the Citypaper under the new business listings this week, the New Somali Restaurant. Sometime in the past couple of months, the New Somali Restaurant opened and I wanted to try it. I know very little about Somali food, or the country Somalia. The little I do know is that Somalia is that it is in the Horn of Africa on the East Coast of Africa, is close to Ethiopia and has some similar foods as Ethiopia, and like much of Africa, many European nations have invaded and occupied this region and country. With that, there has been some European influence in the Somali food from Italy, a one time occupying force in Somalia, has brought a popularity of spaghetti into Southern Somalia. Somalia has a lot of coastline, so fish is used in the coastal regions, and inland chicken, lamb, goat and beef are available. Because much of Somalia is of Islamic faith, most foods are halal, and pork is not halal, so do not look for pork here. So, we get to the New Somali Restaurant, and we are the only ones there at 8:15 pm for dinner. There are 10 dishes to choose from, from spaghetti, rice, chicken, goat, beef and various combinations of these. We ordered a beef with rice dish, and a chicken with spaghetti and rice dish. Both dishes came with iceberg and onion salad, a free beverage that was made up of tea, banana and pineapple, and for dessert, they brought us each banana. 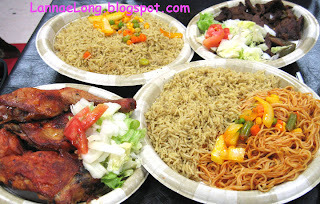 I googled Somali food, and it seems that spaghetti is served with banana, so that is possibly why they gave us bananas. To get down to the food, the beef and chicken must have been baking and kept warm all day long. They were both over cooked and dried out, but seasoned well enough. It was 8:15 pm when we showed up, so we think that the meats were left over from the lunch hour, and they were not going to cook anymore because they were close to closing for the night. 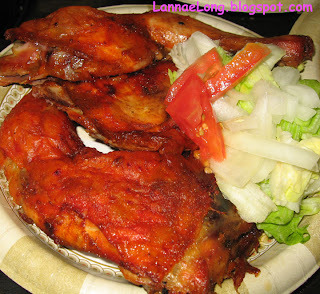 The chicken had a red tint to it, almost like tandoori chicken, and that shows the continuum of foods through this region from India on into Central East Africa. The rice was basmati rice was very well seasoned with most likely sage, cadamom, cumin, possibly a little tumeric, carraway, salt, ghee and other spices I am not sure of. It is possible there was a little thyme in there, to represent a vestige of foods from the British Empire which once occupying this country. There were some onions, and what appeared to be mixed veggies you find in the frozen food section, placed on top of the rice. We enjoyed the rice quite a bit. The New Somali Restaurant offers the rice as its own dish for $4. Through that Italian occupying force, there is spaghetti in Somalia. The spaghetti here was not like the "Ragu" commercials. The was a light sauce on the spaghetti, some tomato-based sauce, but with what spices, I am not sure. The sauce was definitely made by the restaurant, and it tastes nothing like jarred sauce. The spaghetti was good too, and the restaurant offers just a plate of spaghetti for $4. It would be worth a trip to try the rice or spaghetti. This restaurant got a pass on the Metro Health Inspection. Be aware this space is a bit "make shift" in nature with old conference room tables covered by plastic table clothes, and old convention center chairs. But the charm in this place is that it is the same story playing out since the beginning of the USA, and that is immigrants trying to make a living in this country and they open up a shop of what they know, and that would be food. The Irish and British did that with pubs in New England, the Polish, the Italians, the Chinese, the Japanese, the Greeks etc have done that with foods from home. It is now time for our new immigrants to come and find their way and show off their food from their homeland. Thank goodness for new people coming to the USA with international flavors. Yum, I say, Bring it on! I am always up for a kitchy dinner. I mean, come on, the Japanese cook-in-front of you places are always kitchy! So, we went to Shogun in Cool Springs, in the county just south of Nashville. To clarify, most towns with names describing a natural feature, like Oaks, Springs, Mount, often describes what the European settlers found, like a large stand of oaks, springs, or mountains. Cool Springs is no different, and the first settlers found springs that kept them cool during the hot summer weather that the south USA gets. Today, Cool Springs is a far cry from the cooling waters of deep aquifer springs, rather today it is Middle Tennessee's most uncontrolled developed mall and sprawl area. Shogun's fire show - always worth an Ooo and Ahh! In most mall and sprawls, there is always an obligatory Japanese cook-in-front-of-you place. These Japanese restaurants are the original dinner theater in cooking. 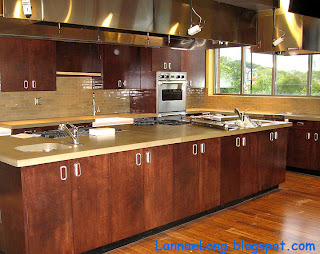 I don't expect a lot from these places, but I do expect a lot of fun and enjoyment from the entertaining cook. For what ever it is worth, I actually like Shogun in this mall and sprawl of Cool Springs because of the freshly cooked food, the show, the people and the reasonable cost. This time, I got scallops for my entree, and it cost less than $20 for a 6 item dinner. What comes with the scallops is a little iceburg salad with ginger dressing (it is ok), a funky weak onion soup that seems like Lipton Onion Soup mixed with 10 times the recommended amount of water (I don't ever eat this), fried rice, mixed fresh veggies, and pink sherbet. Yeah, this all is a throwback to the early 1980's when Japanese Grill restaurants were just gaining popularity, and Shoguns seems to deliver a meal that is better than it needs to be. My scallops were cooked the way I like them, over high heat to char the outside quickly, and just cooked through for tenderness. It is so easy to ruin scallops and Shogun has never done that to me. 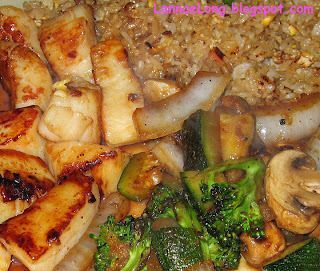 I love the fried rice they make, and I like the fresh veggies they use to make the side dish. I also like that we have to share a table with strangers. There is nothing like breaking bread (or should I say serving rice) with a new friend at the other end of the table. Sharing a Shogun table does take me back to the idea of community and makes me feel good about meeting people that I would have not met elsewhere. 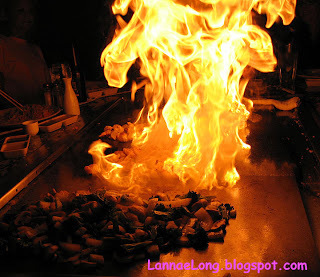 So, when I want kitchy, a nice hot and fresh meal, and feeling social, I am going to find my way to Shogun.